During the holiday season millions of tamales are consumed in the Americas. Six years ago Darlene Tenes of CasaQ, a Hispanic lifestyle company went searching for the best tamale in her hometown of San Jose, CA. Today tamale-makers across the country fly their wrapped wonders in to be scrutinized by the CasaQ staff and tamale connoisseurs. After plowing through over a hundred tamales from goat meat to guava, veggie to venison, pork to pumpkin, the lists gets narrowed down to the chosen few which will compete in the Best Darn Tamale Contest this week. The fourth judge is CasaQ Tamale Taster contest winner Luis Ochoa who was nominated by his staff at Luis Ochoa Family Vineyards in Napa Valley, CA. 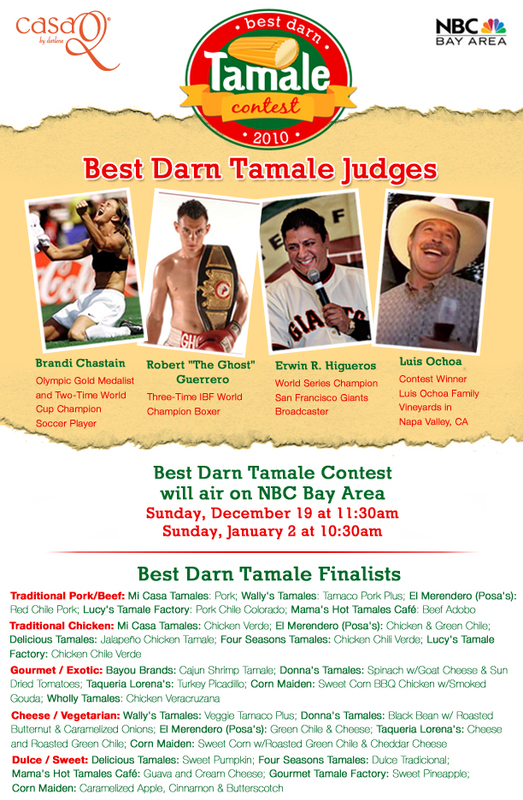 Best Darn Tamale Contest results will air on NBC Bay Area on Sunday, December 19 at 11:30am, repeating on Sunday, January 2 at 10:30am or visit http://www.CasaQ.com/tamales.htm for a list of the winners and other tamale locations across the USA.